In the northwest of Slovenia, near the site Log pod Mangartom, is the incredibly beautiful Fratarica gorge. Over the entire length of the gorge there are 12 waterfalls, with a total descend over 1.000 meters. Throughout the gorge a path follows the river Fratarica. The upper part is only recommended for experienced hikers. 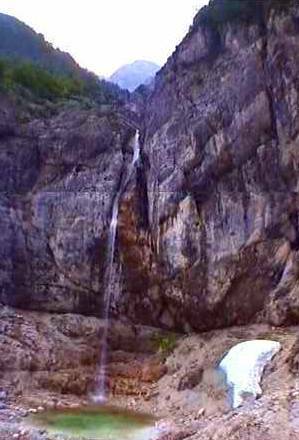 The highest waterfall is called SlapVeliki Drsnik, with a free fall of 112 meters, with a total descend of 120 meters. SlapVeliki Drsnik is not easily accessible, it is one of the falls in the upper part of the gorge. The stream is tiny and best time to visist the fall is after heavy rainfall in Springtime. Slap Parabola is with a height of 48 meters another nice waterfall nearby and is the second waterfall in the valley. Access to Slapa Parabola is easy. From bottom to top you will pass by the next waterfalls:Slap Spodnji limp (5 m),Slap Dvojna latvia (5 m),Slap Škropilnik (5 m),Slap Ihta (5 m), Slap Katedrala (15 m),Slap Parabola (48 m), Slap Šum (4 m), Slap Prvi Zgornji slap (4 m), Slap Drugi Zgornji (10 m), Slap Tretji Zgornji slap (8 m), Slap Latvice and Slap Veliki Drsnik (112 m). The gorge of Fratarica is accessible from Log pod Mangartom. At the fire station (Gasilski dom) there is a sign pointing to Parabola Slap. After crossing the Koritnica River follow a path that leads to the Fratarica gorge. Once in the gorge there is only one way.